The park is open dawn to dusk, all year round. Torr Park lies within the Eastham Village Conservation Area, which recognises the significance of the village’s special architectural heritage and historical heritage. The park was founded in 1927 to provide the people of Eastham village with a recreational space to enjoy. 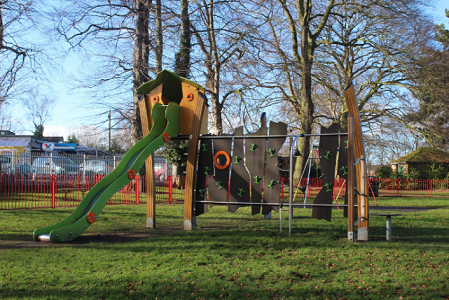 This idea continues today, with a children’s play area, fitness park and plenty of space for recreational activities such as dog walking or playing football. There is a well surfaced path between the two entrances to the park, encompassing the children’s play area. Seating is located inside the play area and surrounding it. The remainder of the site has no surfaced paths, but remains flat throughout.